Jan 15, 2008, Announcing The Launch of Get Your Writing Fighting Fit! At last for me and at last for you. . .
Like any other writer, I'm heaving a huge sigh of relief as I see my book in the marketplace. It's an ebook, so seeing it is a relative term, but I've clicked all the links and they work, so I know others can hold my book in their hands or read it from their computer screens. 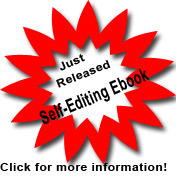 At last for you because if you are a writer on a budget -- and who isn't -- there is finally a book to help you edit your own work. I feel so good about making this book available to all the writers who wish they could afford to hire an editor, but can't. This allows me to help a whole new group of writers I couldn't take time to help before. Thanks to those of you who walked with me on this path to publication. My best wishes to all writers who choose to self-edit!